Selling off the the SAS kit I was working on assembling for the past 8 years for my Ranger. You are getting a Dana 44, a Ford 9", 35"x14.5"x15" Interco Boggers on 15x10 ProComp RockCrawler Xtreme Steel Series 97 Wheels (5x5.5 bolt pattern) with 15" Staun Beadlocks plus a crap ton of parts to renew and beef up the axles. The axles are NOT assembled, but I have what I THINK are most of the parts to assemble them to completion. I just got into this project when I had more money then brains, and frankly with a kiddo in the picture, I'm tired of these things sitting in the corner just staring at me. Hopefully someone can use this stuff. 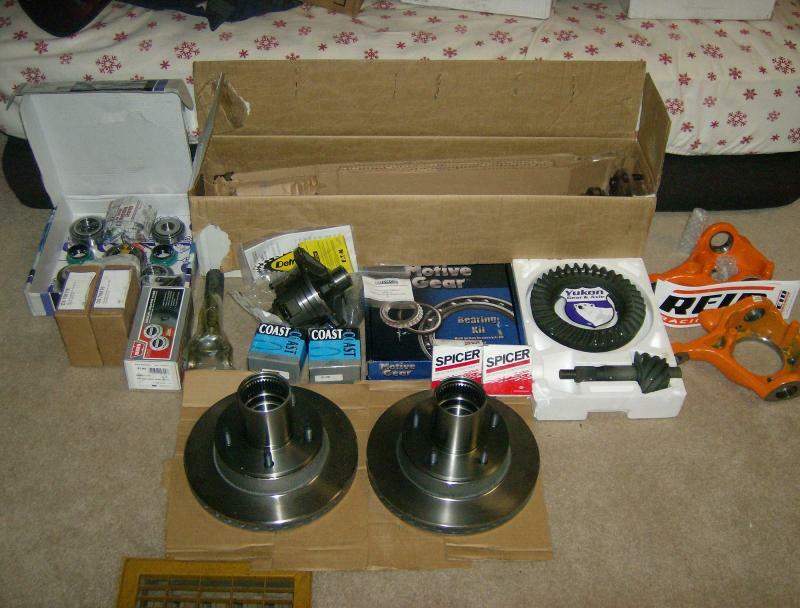 So yeah, back in 2008, I bought a set of axles out of a 1979 Ford Bronco. Yes, they have the cast knuckles so not ideal, but I was planning on running extended radius arm setup with coilovers. I put in a nice fat order from a few different companies (Bronco Graveyard, Rockstomper.com, BCBroncos.com) to get a damn nice set of axles. Plan was to run a Dana 44 Front with a Detroit Locker and Dedenbear Knuckles (for hi-steer if I wanted it later on) with stock axles. The Ford 9" was going to be beefed up nicely with 35 Spline Moser axles, and a ARB Air Locker. Picked up a Strange Engineering Case to fit the bigger bearings of the 35 Spline setup. Gears were going to 5.13. 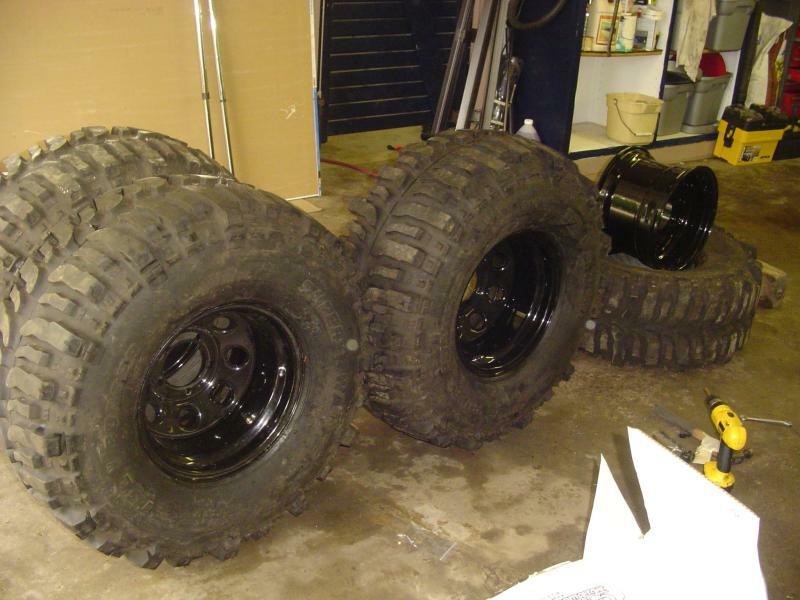 Also, picked up a set of 35 x 14.5 x 15 Interco Boggers used (they were run twice, sitting at 24/32" tread depth where new is 25/32") with some wheels to fit the Bronco axles and then ordered up some Staun Beadlocks. And that's basically that state it's in now. I've tried multiple times to get the 9" together over the years and for some reason the pinion doesn't seem to fit right in the pinion support (seems to long). Tried contact Strange and Bronco Graveyard a few times through the years, but I'm finally giving up. I don't have enough time or the right shop to build this myself, and I don't have the money to pay others to build it for me. Also, in the spirit of honesty, I believe the Pinion Support on the 9" will need to be replaced. Pull out the bearings recently and it appeared to have a couple spots that had broken. Not sure. So anyway, the point. If you feel comfortable assembling an axle, and are looking to run a Dana 44 and a Ford 9", you can probably get a hell of a deal out this. I realize a Dana 44 isn't that great of a setup, but hey, that's why I wasn't throwing a bunch of money at it besides hi-steer capable knuckles a nice locker (plus a rebuild kit). The parts have migrated through about 4 different garages in the past 7 years, and no lie, some of it has some surface rust now. Selling this as 3 items, since I'm sure no one is really looking to get all of this together. If you really want to pick up all 3, let me know and I'm sure I can drop the price a bit. Right now I don't want to split up the items too much just to make sure I get rid of the stuff. Give me 2 months and if it still isn't sold, I'm sure I'll be looking to dump a lot of it.Invoices can be provided for most of the stuff if you want to see them. Boggers and axles were the only things I purchased used (D44 gears were purchased 2nd hand, but they hadn't been used), but most of is probably in a used state now. And again, I can't make sure that everything will work together. I was fairly confident in what I was buying, but I can't say with 100% confidence it'll just snap together if you know what your doing. Anyway, brain dumped as much I could, but I'm sure I missed a bunch of stuff. Ask away with questions. Vast majority of the parts back when I bought them in 2008. Boggers with Wheels and Stauns installed back in 2008. 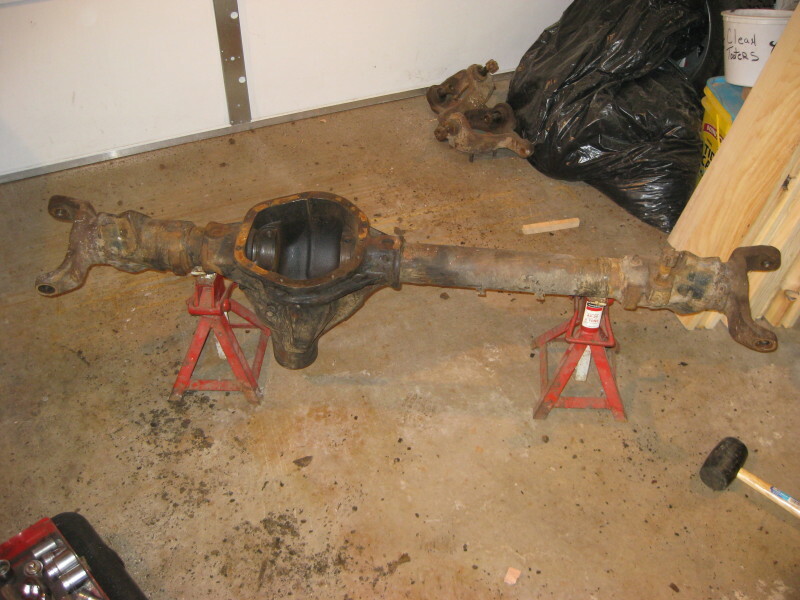 Dana 44 after disassembly back in 2009. Basically the same state today, although the Detroit Locker is sitting in it (just not adjusted properly). I'm working on getting current images of everything but most of this stored out in Wisconsin at my old man's place. Last edited by Rooks; 04-28-2015 at 07:36 AM. No. This is is just some pictures I had on my computer. I can snap some recent stuff of everything if people want. Also, updated the post to be split up a bit. Last edited by Rooks; 04-28-2015 at 07:37 AM. What changed your mind on the SAS? Lot of factors really. I'd still love to do it some day and I have no plans on selling my Ranger. But for now, it's just not a feasible plan. Thought about paying a shop to get the axles together, but then what? I started pricing out suspension for all this and it's just not something I can afford right now or even if I could afford it, I don't have a place to build it. Daughter is 18 months old so free-time isn't really something I have either. Plus there have been lots of discussions about kiddo #2 already. So yeah... maybe some day in the future when I have a garage with some space I'll get back to it, but more then likely, I'd probably look to getting some pre-assembled axles and that would only be after I have the truck all torn down with an idea on how to do all my suspension stuff. That or try and make friends with someone who can teach me how to do axles. Honestly, these axles made me feel stupid. I'm a damn Computer Engineer and yet I couldn't even get to the point where I could assemble something with a diagram in front of me. I don't personally have the garage space for stuff like this, I didn't want to take up my dads shop for it either. That's why I turned to my friend who does this as a side business. My wife and I are talking about kids, but she wanted to me to get this out of the way on the Ranger so I can save for an F150. If you can get the axle reassembled and ready to go, it makes them easier to manage. How about those recent pics? I am interested in seeing all the Dana 44 stuff. Sorry man... forgot to get back here and update the thread. Most of the stuff has been sold as far as the axles goes. Still got the tires, wheels, and beadlocks. But basically only have the housings left for the axles.